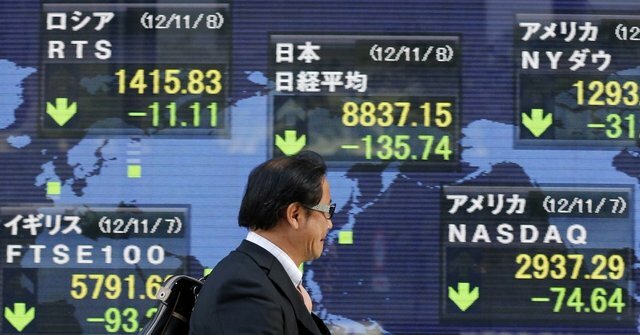 closed lower on Friday, extending losses for a second consecutive day as profit-taking continued after strong gains for a multi-year high, despite the decline, but Japanese stocks posted their ninth weekly gain in a row. <.N225> was down 187.29 points, or 0.82 percent, at 22,681.42. The broader TOPIX index <.TOPX> was down 12.67 points, or 0.70 percent, at 1,800.44.Yesterday, the Nikkei lost 0.2%, and the Topix was down 0.3% on profit-taking after the Nikkei broke 23,000 points for the first time since 1992 and the Topix hit an 11-year high.The Nikkei <.N225> was up 0.6% on the week, posting its ninth consecutive weekly gain, the longest weekly gain since early 2015.Japan's market indexes rose 19 percent this year, bolstered by strong prospects for higher corporate profits and continued economic policies of Prime Minister Shinzo Abe after a landslide victory in last month's general election.